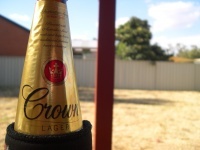 Crown "Crownie" Lager is an Australian Beer, brewed by Fosters. It is considered a premium, full strength beer. This beer is often the full strength beer provided at functions, such as 21st birthday's, weddings, work functions, etc. Rumour has it, "Crownie's" are taken from the same vats as Victoria Bitter. The difference is, the high quality beer at the top is bottled as Crown Lager, while the rest is bottled as VB. 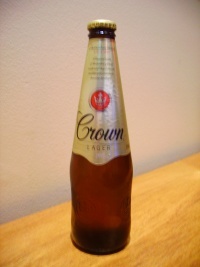 Crownies contain 4.9% alcohol, only available in their unique stubbie form. This page was last modified on 14 October 2012, at 13:15.